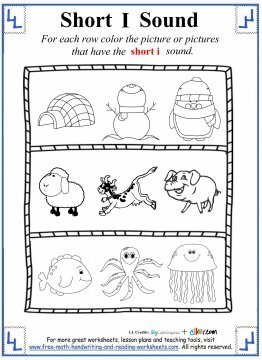 This lesson will focus on the short i sound which is heard in the middle of words like pig or pill. It can also be heard at the beginning of words like iguana and igloo. Below, you will find six different worksheets that will teach your child to identify the short vowel i in words through various coloring, rhyming, and writing activities. 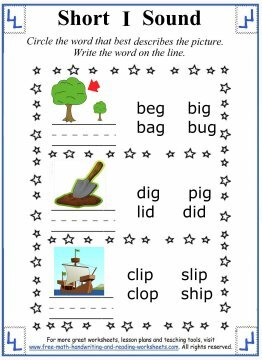 The first worksheet works on identifying the vowel sound in words. The paper has nine different pictures on it. 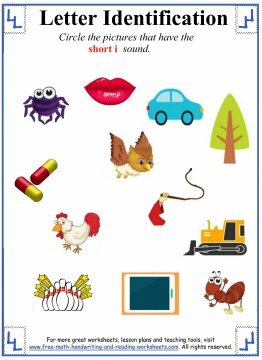 Name the object in each picture and determine if it uses the short i vowel sound. If it does, write the letter i on the line below it. You could also use this time to work on writing skills and have your child write the entire word on the line provided. You could even write the words for all items and then have your child highlight the i in words that use the short vowel sound. Get creative! 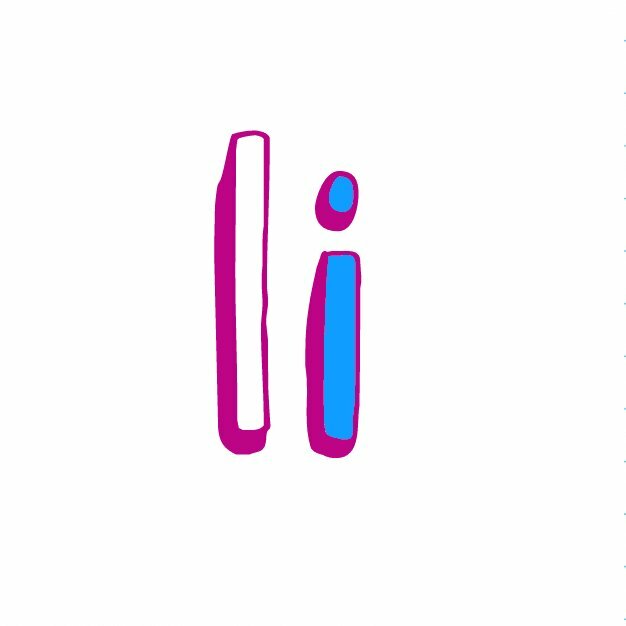 The Web Words activity asks the child to come up with ten words that have the i sound. 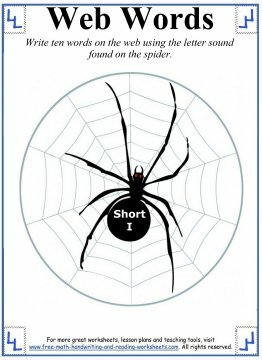 Write the words on the web (there are ten sections, one for each word). Older students can be challenged to come up with more words. Just have them write the words on the blank spaces between the webs. There is room to come up with many more words that way. Make it a challenge and see how many they can come up with. The Letter Identification paper is similar to the first worksheet, except instead of writing the letter 'i', students need to circle the pictures that have the short vowel sound. Again, look at all of the objects and take time to name each one. If it has the correct sound, circle it. In the fourth worksheet, there are three rows. Each row contains three objects. 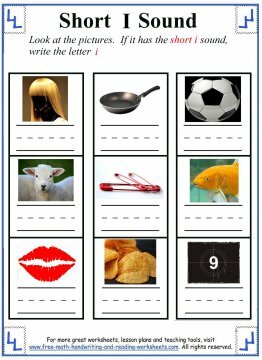 Name the items in each row and if the words uses the short i sound, color in the object. In the next paper, there are three rows. Each one has a picture in it. Below the picture is a line for writing and next to the pic are four words. Name the item, circle the correct word, and then write the word on the line. The final printout is a rhyming activity. There are four boxes which have a word inside them. At the top of the page is a long box with four words in it. Write the words that rhyme from the top box into the boxes below. 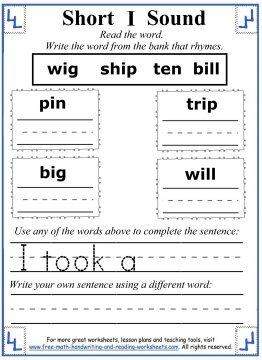 Then they can complete the sentence using any one of the words and finish up by writing their own sentence using a different word.